This Easy Crepe Recipe is simpler to make than you think. 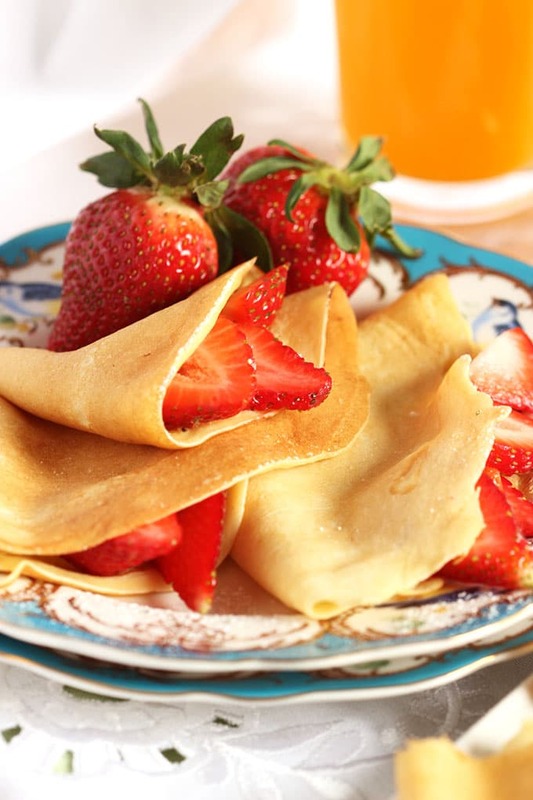 Light, delicate and delicious, crepes are so versatile and great with a variety of fillings. The crepe batter comes together in less than 1 minute with the help of a blender. Have you ever been to Paris? And enjoyed a crepe filled with chocolate at the foot of the Eiffel tower while taking in the magic of the City of Lights? 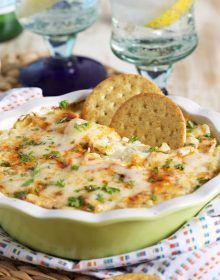 Or perhaps, you’re a savory filling kind of person and order yours with gooey, stretchy cheese. It seems like it would be the perfect street food in a romantic city like Paris but I wouldn’t really know because I’ve never been. It’s on “the list” along with all the food I plan to eat when I get there. All the macarons and béchamel sauces and croissants……I plan to get really fat while I’m there. But here….I love crepes….I love really thin pancakes. (See, what I did there…for all you Ricky Bobby fans.) There used to be a really great crepe place not far from where I live but I’m guessing most people don’t have the fawning affection I do for the light, wispy deliciousness of a crepe. So, it has since closed and the place at the mall kinda blows. I don’t know how they ruin the crepes but they do…they’re all hard and crunchy. No. Just no. The next best place is Rachel’s and that’s in Lancaster….a short 1 1/2 hours away. Not really what I want to spend my day doing just to kill a crepe hankering, know what I’m saying? So, as usual, I take matters into my own hands here. And once again….laziness prevailed when I created this Basic Crepe Recipe so if you can work a blender…..you can make crepes. A crepe is a very thin pancake (as I stated above) and can be savory crepes or sweet crepes. Crepes are, typically, served with a variety of fillings from the very simple like sugar or fruit to the super fancy like crepe suzette. They’re also used to create light, airy Crepe Cakes which is one of my favorite desserts ever!!! What’s the difference between a pancake and a crepe? Simply put, a pancake recipe requires a raising agent in it, such as baking powder or baking soda, which makes it fluffy and light. 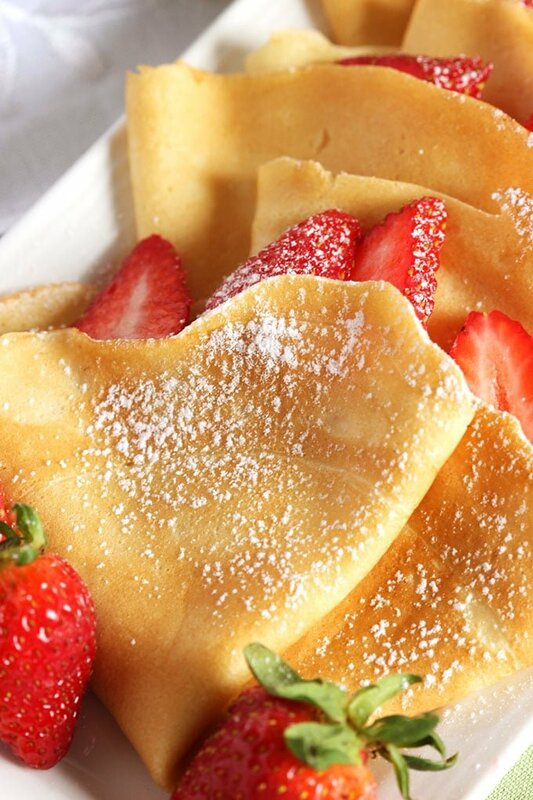 A crepe does not include a raising agent making them, flat, thin and pliable…perfect for your favorite fillings. To create the Very Best Crepe Recipe, I just threw a few ingredients into my blender and gave it a whirl for about a minute….just until smooth. Eggs, milk, water, flour…easy peasy. Then you cook them in a non-stick skillet until golden brown and irresistible. The whole process takes about 10 minutes of hands on time to make the whole batch. I’m not even kidding. The worst part of the whole crepe making process is waiting for the batter to rest 1 hour so you don’t have little annoying bubbles in your crepes. This step….the waiting….is so very important so please practice patience. Even better, make the batter the night before and it will be ready for you in the morning! Just smooth, silky, delicate blankets of heaven to fill with whatever your heart desires. And if you want sweet crepes…I tell you how in the recipe card. Savory crepes….ditto. Basic crepes…you got it. What ingredients are in a French Crepe Recipe? That’s it! How EASY is that??? And if you want to make Gluten Free Crepes, you can use your favorite gluten free flour in place of the all purpose flour. I don’t find the texture to be much different at all so you can make a whole batch of gluten free crepes and nobody will even know. OR….how about artichoke, spinach and chicken for a hearty, yet light dinner. Or a little tomato jam and cheese. OR the toppings for these strawberry crostini. Or you can make one of these amazing Crepe Cakes…..my favorite desserts ever. 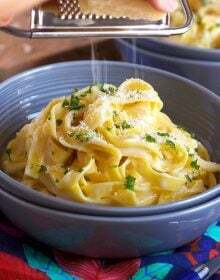 Want even more recipe inspiration? Follow us on Instagram! Light and airy, this easy Crepe recipe comes together quickly in the blender. 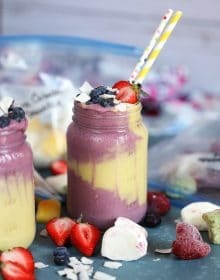 Place all ingredients in a blender and combine until smooth. Allow the batter to rest for 1 hour. Heat a small non-stick skillet over medium heat. Melt 1 teaspoon butter in the pan. Pour 1 ounce of the batter into the center of the pan and swirl with a spatula to spread evenly. Cook for 30 seconds and flip. 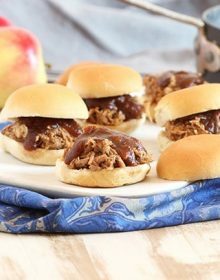 Cook for an additional 15 seconds and transfer to a baking sheet. Be sure the crepe is flat so it can cool. Repeat with remaining batter. After the crepes have cooled completely, stack them and store in sealable plastic bags in the refrigerator for several days or in the freezer for up to two months. 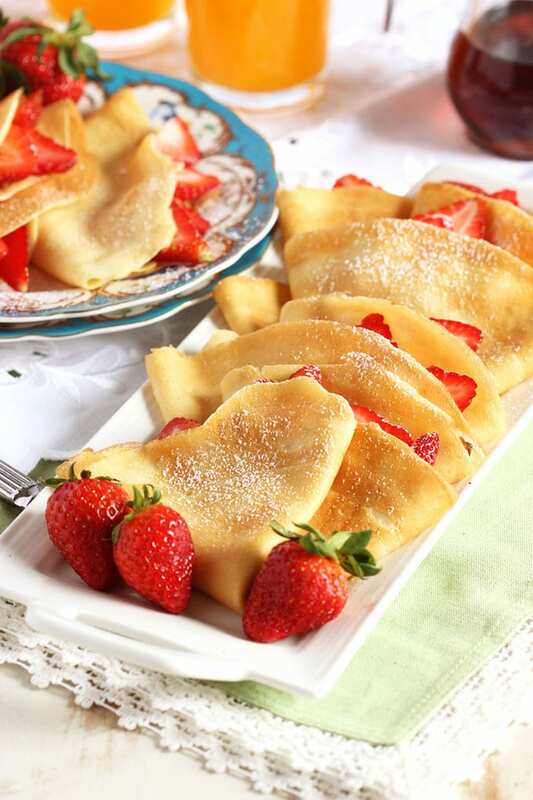 When using frozen crepes, thaw on a cooling rack before carefully peeling apart. To make savory crepes: Add 1/4 teaspoon salt and 1/4 cup chopped fresh herbs or spinach to the batter. 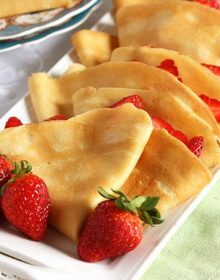 To make sweet crepes: Add 2 tablespoons sugar and 1 teaspoon vanilla extract or 2 tablespoons of your favorite liqueur to the batter. You make these crepes look so easy!! Crepes are one of my favorite breakfasts! These sound so easy and look so perfect! Could you use regular milk instead of half & half? And if so, should I use the same amount as half & half? If you use whole milk, you should be good. The batter may be a little thinner so adjust the cooking time accordingly. My mom used to make us crepes for special Sunday breakfasts. 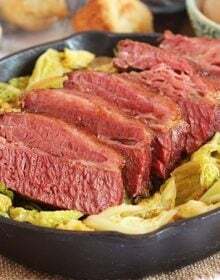 I have no idea what recipe she used, so I cannot wait to try yours! These sound so easy yet they intimidate me so. We have a local cafe that serves all kinds of crepes and they are so good. Will definitely need to try these on my own!